When I first heard that the current theme was “memory” or “memories”, I hesitated. I haven’t had much in the way of wonderful memories in the past couple of decades, and I knew I didn’t want to revisit the past. Then three ideas came to me – two of which I’ve put into fabric. The first (above) is “Alice: Remembering a Quilter”. It’s created from a section of an old, worn, much-loved quilt made by my Aunt Alice Rennie (1907-2002). I’d already cut pieces of this quilt to use in another project, so this wasn’t the first cut. I simply traced her name into what once was a nine-patch (the floral print has faded so that it all looks white), and embroidered the letters with satin stitch, by hand. I then bound it in a blue batik fabric that toned in with the blues in the piece. 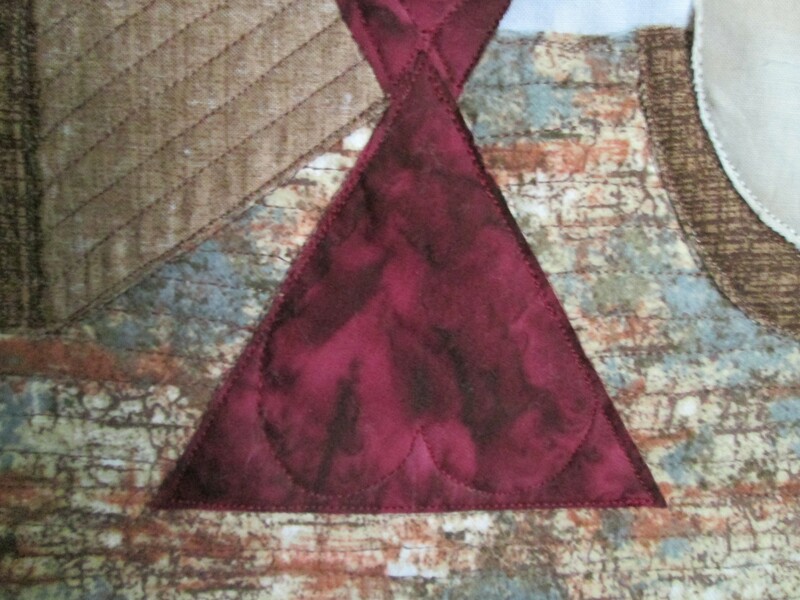 The hand quilting of the piece is the original – I did no quilting on this myself. It’s a tribute piece, and one I will hang in my studio. The second, “Anamnesis”, is the piece I am submitting for the challenge, even though in the end it’s a bit narrower than it should be (14.5” W x 15” L). The heart of Christian worship is the Eucharist, also known as ‘The Great Thanksgiving’ or ‘Communion’. The act of Eucharist is an ‘anamnesis’ – the Greek word for ‘remembrance’ – based on the words Jesus spoke to his disciples at what is referred to as The Last Supper. When his followers partake of bread and wine, they are to do so ‘In remembrance of me’. The layout of the piece came to me all at once, and I knew I had the perfect fabric for each part. 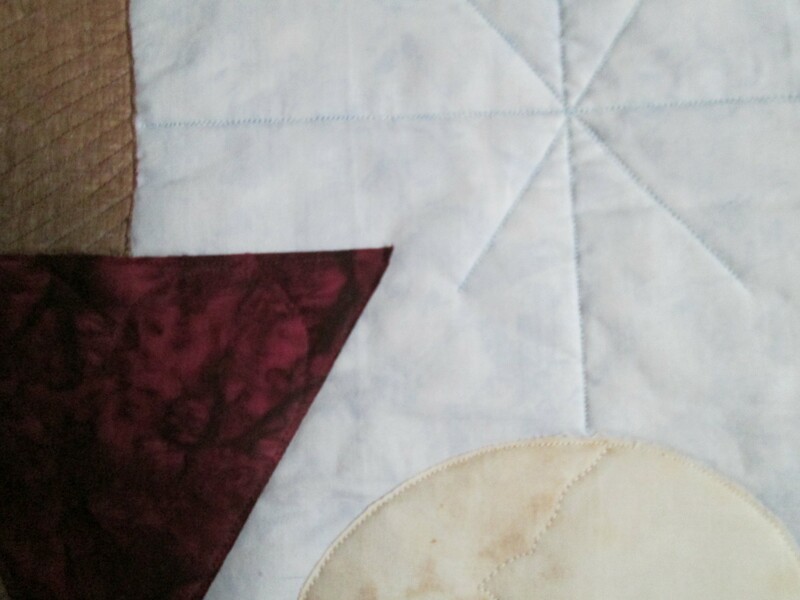 I wanted to keep the shapes very simple, and I wanted the quilting to be clean and a bit symbolic. The wooden pillar at the left is a symbol of the cross and Jesus crucifixion. The red vessel is a cup of wine; the bread is next to it on a small plate. The vessel is quilted with the shape of a heart, top and bottom, to symbolize Jesus love for all humanity. The bread is quilted with a jagged line to symbolize brokenness – that of humanity, and that of Jesus body at this execution, ‘broken for [us]’. The patterned background on which the elements rest symbolizes Jesus’ time in the desert before his ministry, and the landscape in which he carried out much of his work. The blue background is quilted with lines symbolizing a star – the star under which Jesus was born, and a reference to Christians’ belief in him as the Light of the World. Materials: commercial cotton and cotton flannel, cotton batting, cotton thread. 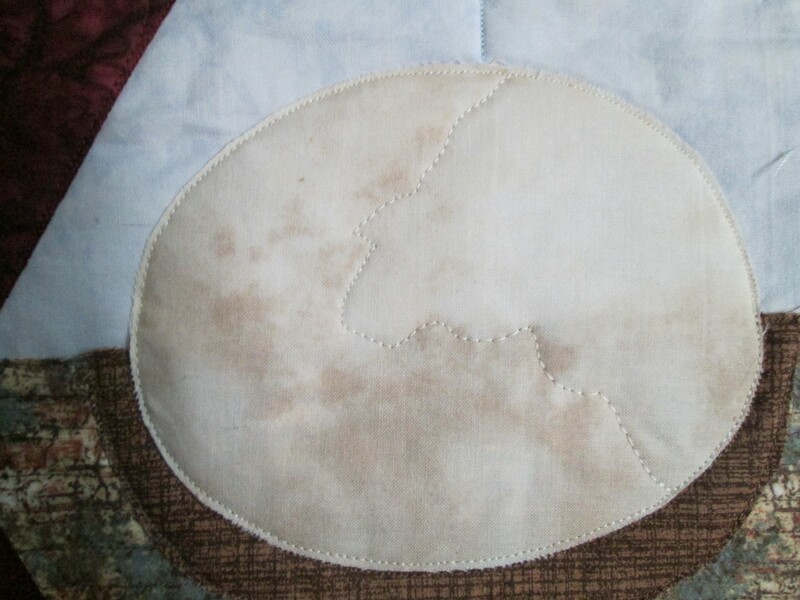 Techniques: fusible appliqué, machine quilting. 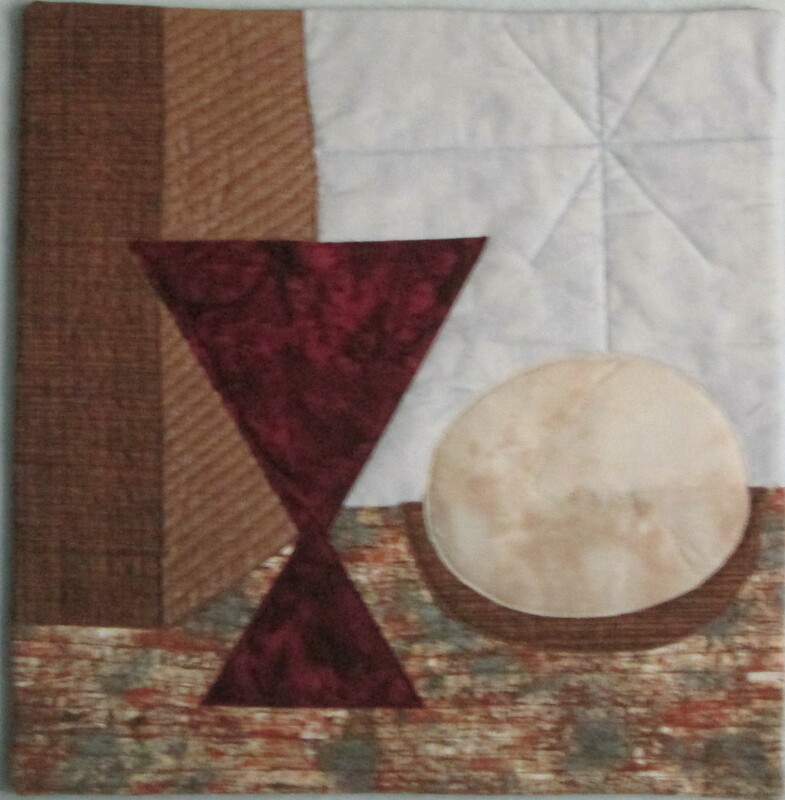 Margaret this is a great tribute to the Christian belief and also a tribute to your skills as a quilter. Well done. PS love your tribute to Alice.